This stunning landscape image was taken in Moraine Park in Rocky Mountain National Park. It shows off so much of what makes Estes Park a perfect place to be an outdoor wedding photographer- the deep blue skies, vibrant colors, and pristine wilderness. This area is a perfect spot for couples that are willing to walk a short distance for some amazing views. Here Lauren and Justin hiked with their trusty chacos and hiking books to the river's edge. I got down almost at water level to take this one and waited for a natural moment to capture an expression that matched the beauty of the scene. Amazingly I didn't get wet to get this shot! I composed the image so that the couple was square in the middle of the valley, so the lines of the mountains and scenery all lead the viewer's eye to the couple. Moraine park is located in Rocky Mountain National Park in Estes Park, Colorado. 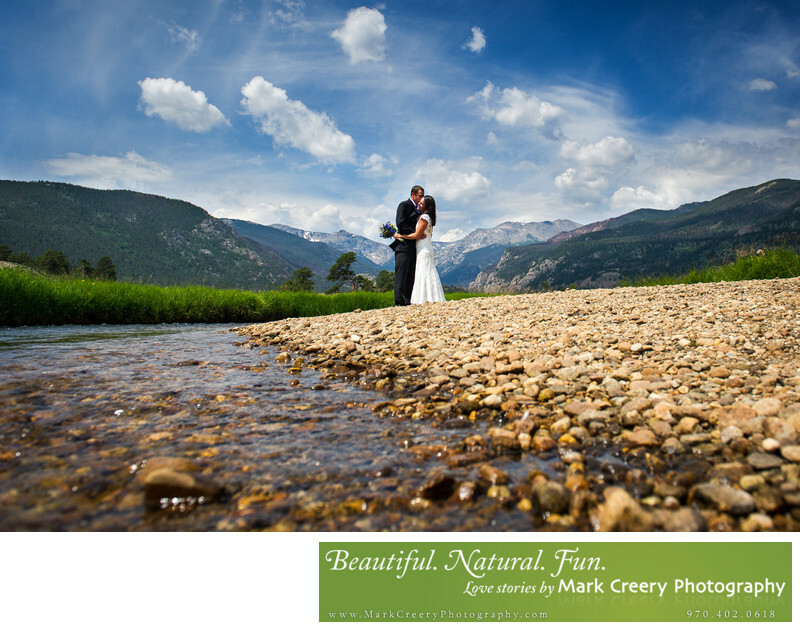 To get married in the park or take photos requires a permit, which can be obtained by calling (970) 586-1209. Location: Moraine Park in Rocky Mountain National Park.